Correa ‘Coliban River’ is a cultivar of Correa glabra var glabra. Specimens of the cultivar were collected, in 1986, from near Kyneton, northwest of Melbourne, Victoria. 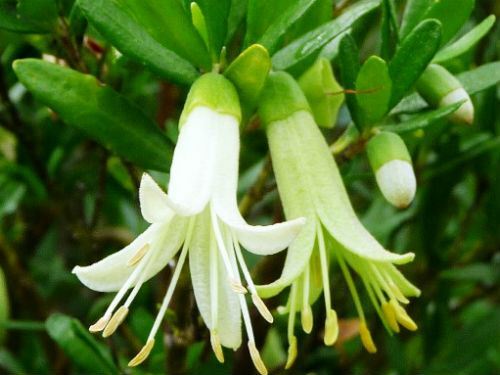 Correa ‘Coliban River’ is a dense shrub that, in our garden, reaches a maximum height of two metres. Narrow leaves are three centimetres long, glossy on top and paler below. The Correa glabra group have unusual, aromatic foliage. Tubular flowers are two centimetres long, yellowish green with flared tips. The main flowering period extends from autumn through winter with sporadic flowering at other times. In autumn and winter our plants are covered in blooms for months. Correa ‘Coliban River’ is a very hardy, free flowering shrub. If you only have room for one Correa this cultivar would be worth considering. Occasional tip pruning is appreciated. This is one of many native plants that will take kindly to container culture. As with most Correas this cultivar propagates readily and rapidly from cuttings. For those interested in Correas we would recommend Correas Australian Plants for Waterwise Gardens by Maria Hitchcock, a life member of APS. This is a splendid publication covering all aspects of the history, identification, propagation and cultivation of this unique Australian genus.